Galaxy Quest is a blast from the past that my 10-year-old and I found on Netflix. And, despite being "from the 1900s" - as my son would say - he agreed to watch it with me AND then proceeded to request that I feature it as a my weekly family movie-night pick. 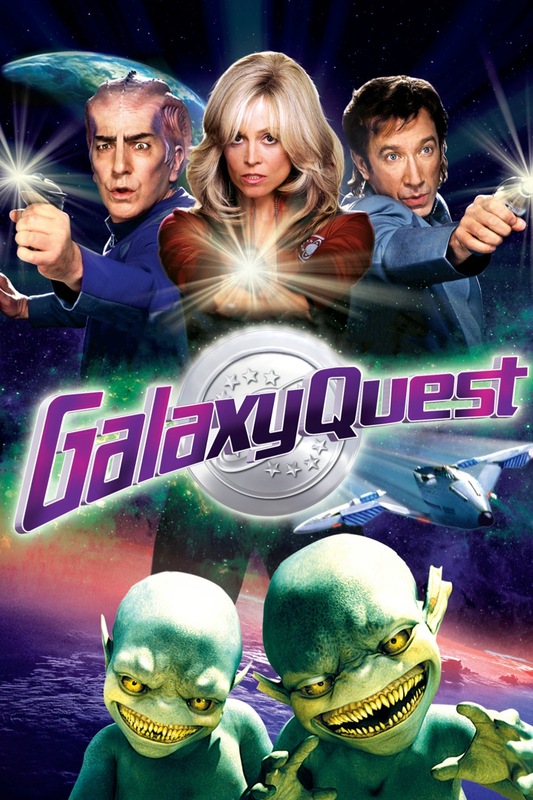 Galaxy Quest which was released in 1999 became a cult classic among science-fiction fans and won numerous industry awards. The cast consists of Tim Allen, Sigourney Weaver, Alan Rickman and countless others including a very young Justin Long. The film is a clever spoof on the fandom that surrounds Star Trek even to this day. Have you ever wondered if there are alien civilizations out there modeling their entire existence, all their technology, on our popular science-fiction movies? Well, that's exactly what happens in Galaxy Quest. The film follows the washed-up actors of a popular television show, Galaxy Quest, from the 70s and 80s as they continue to profit from the show's success largely because of its die-hard fans. The actors are now making a living by booking special appearances and, naturally, attending the annual Galaxy Quest conventions. However, when a group of real aliens come to earth seeking the help of these fictitious space heroes, these actors must prove that they can live up to their characters' expectations. Will they be able to pull from their knowledge of their television scripts, channel their inner strengths, and succeed in the mission? Galaxy Quest is parody at its finest. It is full of laughs and is a bit goofy with cheesy special effects. However, this is what gives the film charm making it a classic. Science-fiction fans of any age will certainly appreciate this film, but I feel there is enough here for the entire family to enjoy. The film is rated PG for fantasy violence and action, mild language and some adult content. There are some creepy alien creatures that may not be suitable for very young viewers, but overall, this is a fun, action-packed film the entire family can view for movie night. Leave it to Netflix for finding these unique finds! If your son likes or develops an interest for Star Wars in the future then Spaceballs is a hilarious spoof or parody for Star Wars. However, I would not let him watch it even though it is rated PG, because it does have a good amount of cussing and mmm let's say comments for lack of better words that he might not pick up on or would be inappropriate for his age. I vaguely remember that film, I'll have to check it out! He does like Star Wars.